This type of rice releases a natural chemical that destroys weeds. Photo Courtesy of the United States Department of Agriculture. Photo by Joanne Dilday. Rice was brought to America in 1685 aboard a ship from Madagascar that took shelter from a storm in Charles Towne harbor in the present day state of South Carolina. The ship’s captain presented the colonists with rice seeds for helping to repair his ship. 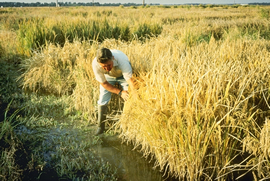 The local marshlands proved an ideal environment for the new crop, which was so successful that in 1700 colonists exported 300 tons of rice to England. Today rice ranks fifth in production value among crops grown in the United States. About 90% of the rice grown in the U.S. is for domestic consumption. Most rice grown in the United States is long grain rice. In Japan, shorter grain rice is more popular. California is the largest grower of short grain rice in the United States. On average, Americans eat 26 pounds (12kg) of rice annually while Asians consume 300 pounds (136kg). Hawaii has the highest rice consumption per person in the U.S. at an average of 100 pounds (45kg) per year. Click on CHARTS and MAPS below for additional information about rice.